This week has been much better than last week. We didn’t have any sick kids and we are falling into a summer routine more and more. Something that I didn’t expect happened this week. I’ve really been struggling to find patience with my 11 year old because she is so moody, but this week I don’t remember any outbursts or moodiness. In fact, it was a very pleasant week and her and I spent a lot of time talking to each other. I didn’t expect that to happen at all! I feel like whenever I make an effort, no matter how small, my efforts are magnified and somehow things just get better. I feel like this parenting plan is really working so far and I’m glad I’m trying it out. So in this parenting plan month 1, I am experimenting with spending 15 minutes of 1:1 time with each of my 3 kids and posting on what happened that week. This week my 8 year old and I have been picking raspberries every day together. 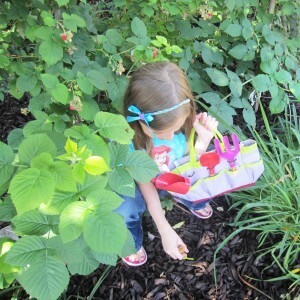 I love when it’s quiet outside and we can hear the birds chirping and discover hidden raspberries. Then we come in and scarf them all down before anyone else can see that we got them! My daughter and I also pulled weeds and harvested some lettuce and green beans this week. I love it when we did gardening together. I think it’s so fun to teach my kids about how to grow things and how healthy it is to eat fresh fruits and vegetables from the garden. This week we had a zuchinni, green beans, and yes! some tomatoes. My son, who is 5, and I read books together every day. 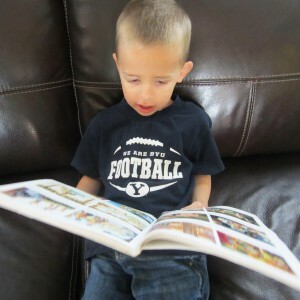 He is getting ready to start kindergarten in the fall and has a love for books. His most recent favorite is Are You My Mother? by Philip D. Eastman. I have seen him progress very very far as we have read for 15 minutes together every day. He loves to snuggle up with me in my bed and bring books to me. I let him sound out the words himself and I am always surprised by how well he can do it on his own for his young age! I can’t take all the credit for his learning to read, he attended an academic preschool when he was 3 and 4 and learned the basics there. 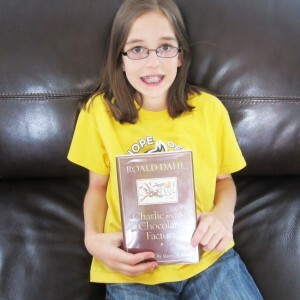 I have learned that reading with Mom and Dad makes a huge difference too! In this photo he is reading scripture stories from a Children’s reader. My 11 year old read Charilie and the Chocolate Factory by Ronald Dahl this week. After she read it, we watched the 2005 movie with Johnny Depp and the 1996 version with Gene Wilder (which I adore!) and we compared all 3. Stay tuned in to our Kids Book Group where we will talk about the differences between the book and the movies. My daughter thought it was super fun to read the book and watch the movies and the best part was doing it with her. I think over the last few weeks, we’ve built a stronger bond than we’ve had in a long time. Another thing we do every night together is cook. She is really interested in how to make meals, so she hangs out in the kitchen with me and we talk and she mixes and stirs and learns how to read a recipe. Win Win if you ask me!